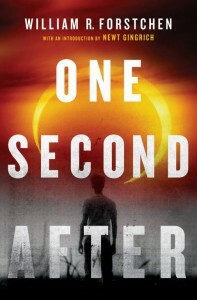 Since part of my science fiction reading has involved post-apocalyptic scenarios, it should come as no surprise that I happened across One Second After by William R. Forstchen. The book chronicles the events in a rural North Carolina town after a high altitude nuclear detonation hits the United States with an Electromagnetic Pulse (EMP). Without getting into technical details, the effects of an EMP have the potential to render nearly all electronic devices useless, including anything that relies on electronics. Mobile phones, computers, and even cars are paralyzed. More importantly, the public infrastructure that we depend upon that supplies water and electricity is also crippled. The book details how quickly things breakdown without the benefits of electricity, water, and transportation. Modern conveniences such as refrigeration no longer work meaning storage of food becomes an immediate problem. Likewise, lack of transportation means store shelves will not get resupplied. While I would hope it wouldn’t turn to anarchy, Forstchen paints a picture where things quickly deteriorate into every man for himself. It’s not a pretty picture, and as time goes on, things only get worse with the spread of infectious diseases due to lack of medication. Furthermore, bands of thieves form to take advantage of the lawlessness to commandeer resources from people weaker than they are. In summary, the story is about one man’s determination to protect his family and community through what feels like insurmountable odds. Reading the book made me realize three key things about what has changed over time in our country and in our society. We have become dependent on a centralized, federal government. When disaster strikes, we don’t look to our local officials for guidance. We wait for the federal government to tell us what to do. This hit home for me in the story when just days after the EMP hits, the community leaders are still waiting for someone to tell them what to do. It’s a scene that plays out in many local disasters. Communities become reliant on external resources and support instead of building the capability to survive on their own. It highlights an issue which I feel has become a serious problem in the US, government power needs to transition back to the local level and away from a centralized, federal government. Our basic survival skills have atrophied. In other words, skills that 50-100 years ago would have been common knowledge – such as preserving food without refrigeration, hunting and processing animals, caring for basic wounds and illnesses, efficiently using food and water resources, and personal hygiene concerns without access to the conveniences of running water and indoor plumbing, are not taught anymore. In other words, we’ve become reliant on our modern conveniences and have neglected to maintain our basic survival skills should those conveniences disappear. Our society is pampered. I call it first world problems. The things we complain about on a daily basis are not a matter of life or death. They are a result of us taking our access to modern amenities for granted. We’ve also developed a lot of medicines and methods to care for people who would not have survived one hundred years ago. It’s quite amazing when you think about how we are able to preserve human life, and how quickly it could be taken away if access to modern conveniences were not available. Overall, I found One Second After to be one of the better near-term post-apocalyptic stories I’ve read. It wasn’t nearly as over the top as Cyberstorm and held together better than Renewal. I’ve put it in my Must Read category of books as I think it is an important read to raise our awareness of the risks we would face without access to our modern conveniences. I wouldn’t panic during (or after) reading it, but I would encourage you to use it as an indicator of what is possible and to make sure you are prepared in case the worst ever does occur. This entry was posted in Book Reviews, Must Reads and tagged Books, Must Reads on March 23, 2014 by Gregg Borodaty.